Want To Change or Cancel Your Flight or Hotel Bookings? No Problem! Book some bargain travel, Save money and earn Nectar Points! Where do I use my Expedia voucher code? "Stay up to date with all sorts of time-limited package holiday deals, hotel sales, money-saving special offers and competitions via Expedia’s social media pages. By following Expedia’s social media channels you also have the chance to enter competitions to win everything from state-of-the-art gadgets to exotic holidays! The Expedia Twitter page is the most updated social media account, where Tweets are sent out several times a day, so check in as often as you can if you don’t want to miss out on the next big promotion." "If you book your hotel or flight and hotel package with Expedia and then happen to find the exact same hotel or package for less on another website, Expedia will match the cheaper price and refund you the difference. To claim the best price guarantee you’ll need to get in touch with Expedia at least 48 hours before you check in by filling out the application form on the Expedia website." Expedia is one of the biggest names in the travel industry. They find millions of published and discounted fares from over 450 airlines, 80,000 hotels, apartments and villas in popular destinations like Dubai, the Caribbean, Spain, Greece, and the Maldives to provide you with cheaper holidays. Expedia guarantees the lowest prices on your hotel booking or they will refund the difference, you can expect no nasty surprises or hidden costs, clear user-friendly information (to make the choosing and booking process simple) and ATOL protection for all package holidays that include a flight. 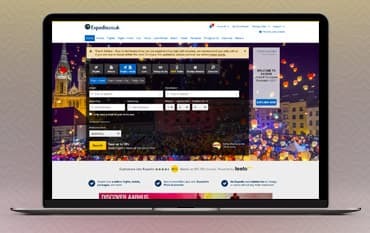 Expedia offer flights to worldwide destinations such as America, Europe, Canada, Australia, Mexico, the Caribbean, Asia, the Middle East, South America, Africa and more. Through their great relationships with the most respected airlines in the world, Expedia can offer exclusive flight offers and seat deals that are unavailable elsewhere, which can all be found here at Netvouchercodes. Search for a flight with Expedia and find all the information you need to book your airline ticket quickly. Search for your flight based on preference, whether that be: timings, prices or airports and guarantee the most convenient journey to your chosen destination. For even bigger savings you can combine flight tickets with a hotel stay in an ATOL protected package for both last minute trips and holidays scheduled months in advance. It has never been easier to book a low-cost flight with Expedia whether you're flying via economy, business class or first class. And with our money saving voucher codes and offers, you can save even more money on your flight. Expedia has made searching for hotels across the globe easy with their huge range of accommodation, from 3* budget hotels to luxurious resorts, all with fantastic deals and amazing prices. Whether you’re heading to a bustling city centre in New York, Barcelona, London or Rome, a sun-drenched paradise in Turkey or the Caribbean, or an action-packed family resort in Spain you can find the ideal hotel at Expedia, as well as flexible deals on hotel and flight combinations, perfect for long-haul holidays, so there’s no need to worry about travelling further afield. Expedia’s customer-friendly booking engine guarantees to provide you with the best price for your hotel room, and with over 365,000 hotels in the catalogue, you can be reassured that it will also be your ideal choice. You can also check out the last minute section at Expedia where there’s a wide selection of bargain hotels, even better, with Hot Hotel Deals at Expedia, you can find the cheapest hotel rooms available anywhere. All these deals, plus more money saving Expedia hotel discount codes, can be found above on our Expedia deals page. Expedia offer bargain prices on car hire as well as a great number of deals on combined car hire, flight and hotel packages. Their holiday car hire packages include flexible pickup and drop off options, meaning there’s no need to wait around for your car and that there’s the option to choose from different drop off locations. Whether you’re holidaying in Spain or jetting off to Florida you can find great rates on car hire from Expedia. You can even choose a car to rent that fits your budget, the number of people that need seating and via the car company you prefer. If you require any special equipment like sat navs, car seats or snow chains you can reserve them upon request, you can also specify your preferred style of hire car whether that be a flashy convertible or family sized people carrier. And, if you like to travel in style you can choose from Expedia’s selection of luxury car hire options that also come with great value for money deals. For the best hire car and reliable service choose Expedia and don’t forget to use our voucher codes before you book to ensure you save money on your car hire. Another common promotion Expedia likes to offer is hotel discounts, with a wide variety of hotels regularly featuring price reductions of up to 25%. If you already have a firm budget in place with regards to how much you want to spend on accommodation for your next holiday, try looking at hotels which are just a little bit more on the expensive side. If these pricier hotels come with a special discount, they might just fall within your budget, allowing you to enjoy more for less. If you have still not received your booking confirmation 24 hours after booking your flight then check the spam/junk folder of your email account. You should also make sure you have entered the correct email address and if you have, you can then contact Expedia. The name on my ticket is incorrect, what should I do? If you have booked your ticket through Expedia then please contact them directly. Most airlines will allow the details to be changed without a penalty if the changes are made the same day the tickets are booked. Retrieve your airline confirmation code from your itinerary and select your airline to check-in on their site within 24 hours before your flight. Some airlines may allow you to cancel or change your flights, to check if yours does view the details in the 'Airline Rules and Regulations' section in your itinerary. Expedia are experts in finding the best travel deals around and know that the most important part of any trip or holiday is you. Using our valid Expedia voucher codes you'll find great deals for your next getaway - whether you’re staying in the UK, heading to Europe, or going even further afield - on long holidays, last-minute packages, short breaks, business trips and ski adventures alike. We are constantly on the hunt for Discount Codes for Expedia to help you with your money saving. Our experts check dozens of sites for secret codes including NHS discounts, student sites & social media channels saving you time & money!